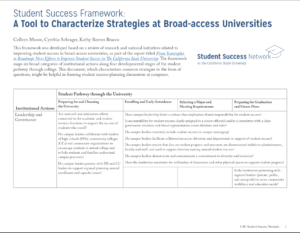 This framework was developed based on a review of research and national initiatives related to improving student success in broad-access universities, as part of the report titled From Scatterplot to Roadmap: New Efforts to Improve Student Success in The California State University. The framework maps six broad categories of institutional actions along four developmental stages of the student pathway through college. This document, which characterizes common strategies in the form of questions, might be helpful in framing student success planning discussions at campuses. Join our mailing list to stay involved.